The 14th book in Emily March's contemporary romance series Eternity Springs comes out February 27. Caitlin Timberlake had done well in a NYC design firm but wants to return to her Colorado roots and start a family. Returning for a friend's wedding is an ideal time to evaluate that plan, especially after she meets Josh Tarkington and asks him to be her plus one for the wedding. The sparks fly, but Josh is reluctant to have any kind of relationship because of his past. 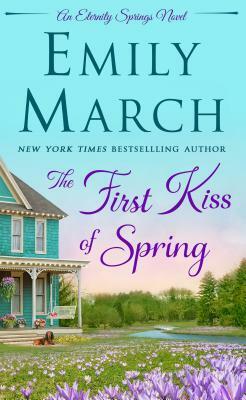 The First Kiss of Spring is part of the Eternity Springs series of romance novels. Even without reading the other ones in this series, this novel works because it plays off the common romance novel tropes. Caitlin and Josh meet cute and are forced to spend some time together before she makes her impulsive decision to invite him to her friend's wedding. There's even the adorable pet, Josh's paralyzed dog Penny. Josh is a pessimist when it comes to his future, luck, and relationships.